Duchesne • Chad Hintze was hanging drywall Sunday when the fire started. Hintze, like several others in the area between Strawberry and Starvation reservoirs that’s now burning in the Dollar Ridge Fire, was still finishing his getaway cabin. When the fire started, it looked like he and his neighbors would be spared from the blaze, then about 10 miles west of his cabin. It ballooned overnight and the next day, reaching more than 47,000 acres by Friday morning. Quickly, they found their homes in the middle of a massive containment area they can’t access. They’re now among the dozens who are waiting to find out if they’ll have anything to go back to when fire crews extinguish the Dollar Ridge Fire, about 100 miles east of Salt Lake City in the Uinta Basin. Another 1,100 people have been evacuated, left to watch the fire’s activity while hundreds of firefighters attack the blaze. “I just wanna know if she’s there or not,” Hintze, 42, said of his cabin Friday. He might not know anytime soon. Crews on Friday were still working to get the fire under control, with high temperatures and winds blowing from the southwest. By Friday evening, the fire was 5 percent contained, and 1,000 homes north and east of the boundaries were at risk. So far, the fire has destroyed 90 homes. Like many others in the fire’s path, Hintze’s cabin is uninsured. He’d been working on it for about five years and has about $130,000 invested in it, he said. He’d been working in recent months to get fire insurance, and fire isn’t covered under his standard homeowner’s insurance, he said. “They won’t insure anything up there,” said Frank Andreasen, 59, of West Valley City, who also has a cabin in the area. Andreasen was told difficult access for fire personnel made it unlikely to be insured, so homeowners often took their own precautions. Andreasen said no trees surround his cabin, though he was nervous about a 300-gallon propane tank nearby. “I’m holding out a little hope,” Andreasen said. The fire tore through parched trees and grasses, fueled by dry, hot conditions. Temperatures were in the low- to mid-90s Friday, and are expected to be the same through the weekend. There are thunderstorms in the region, but no clear sign of rain to help squelch the fire. Crews on break lounged in a grassy field at the Duchesne County Centennial Events Center, the incident center where dozens of tents and cots were set up for the staging area. Evacuees met at the Duchesne High School, where the American Red Cross distributed food and bottled water, and where streams of trucks pulled in to drop off more supplies. Some at the high school were able to check on their homes this week, north of U.S. Highway 40. That tour put Charlie Nay, 63, at ease after days of stressing over his house and numerous outdoor cats that stayed behind. They were still there. So was the house. Tarey Everill, a 53-year-old evacuee, sat in the high school cafeteria with Nay and recounted the dangerous trek that brought him there. Everill took a gamble, waiting for two days after law enforcement told him to leave. The fire was closer by then, and running. He started his 1972 GMC truck. It didn’t want to run, low on gas. The flames were getting closer. A 6-foot-high pile of wood was in front of the truck. If he wanted to get his trailer home out of the area — and get out alive without leaving it behind — he had one choice. Everill charged up and over the woodpile, hooked up the trailer, and left town, truck sputtering and stalling on the way before a neighbor helped pull him down the highway as flames climbed a nearby ridge. It’s possible there are pockets within the fire’s path that haven’t been burned, but crews were focusing on containing the northern boundary near U.S. 40. The highway was closed most of Friday, but the Utah Department of Transportation and Utah Highway Patrol reopened it at 6 p.m. The speed limit has been lowered to 35 mph, and a “no stopping” zone is in place between mileposts 56 and 59. After hearing about the fire, Rick Stevenson said he drove to his cabin from his house in Bountiful. He grabbed pictures and his dog’s remains. It was his only chance to get any irreplaceable items before the area was evacuated and the fire spread. Stevenson said his cabin is insured, one of the few in the area that he knows is, and he’s already filed a claim with his insurance company. He said he’s not expecting to return, and even if his house is spared, it won’t be the same. • The West Valley Fire, about 10 miles north of St. George in Washington County, was 28 percent contained as of Friday morning. It has burned 11,716 acres and has more than 600 firefighters battling it. 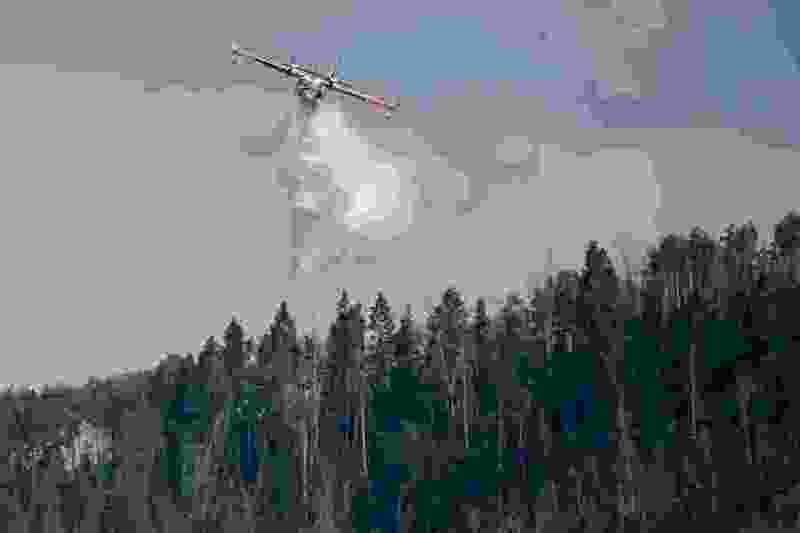 • The Willow Patch Fire, 9 miles east of Richfield in Sevier County, was 80 percent contained as of Friday and has burned 4,582 acres. 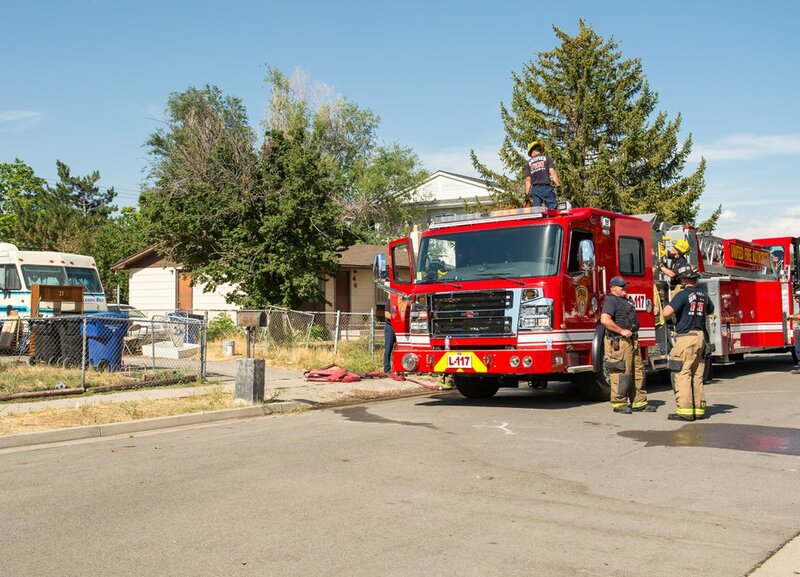 • A grass fire Friday in Kearns spread to backyards and did exterior damage to two homes, FOX 13 reported. The fire began about 3:30 p.m. near 4100 West and 5800 South, destroying several sheds and burning several yards. The Unified Fire Authority said 55 firefighters knocked the fire down quickly. (Rachel Molenda | The Salt Lake Tribune) Firefighters finish their work at the scene of a fire at 4094 W 5820 S in Kearns, Utah, on Friday, July 6, 2018.